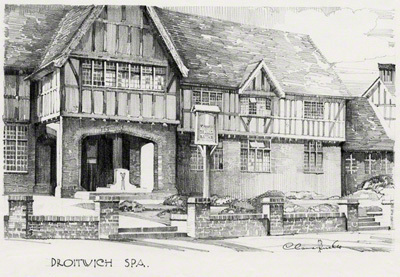 A very fine and detailed pencil drawing of Droitwich Spa standing in Victoria Square. Claude Buckle's image seems to capture the building as it was in the 1930's. Droitwich Spa is a town in northern Worcestershire, England, on the River Salwarpe. The town is situated on massive deposits of salt, and salt has been extracted there since ancient times. The natural Droitwich brine contains 2½ lbs. of salt per gallon - ten times stronger than sea water and rivalled only by the Dead Sea. Created in 1933.